SHAFAQNA – Dr. John Andrew Morrow recently returned from Washington, DC, where he participated in the Islamic Society of North America’s Annual Government and Interfaith Forum. Morrow, a Muslim scholar, author, and activist, was the first to address at a Press Conference held at the National Press Club on April 14, 2016. Called upon to launch the interfaith conference by Dr. Sayyid Syeed, the National Director for the Office for Interfaith & Community Alliances for the Islamic Society of North America (ISNA), Morrow commented upon the Covenants of the Prophet Muhammad and the Covenants Initiative. Described by Catherine Shakdam as “the book of our generation,” The Covenants of the Prophet Muhammad with the Christians of the World is a scholarly study of the treaties that the Messenger of Allah concluded with the People of the Book. Thanks to the vision of Charles Upton, the book morphed into the Covenants Initiative, an international movement of Muslims to protect persecuted Christians which later expanded to include Jews, Shiites, traditional Sunnis, and Yezidis. 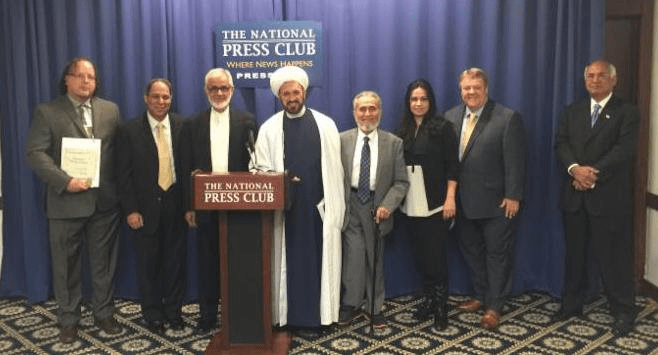 The Press conference featured prominent Muslims leaders such as Azhar Azeez, the President of ISNA; Imam Mohamed Magid from the Adams Center; Dr. Muzammil Siddiqi, Chairman of the Fiqh Council of North America, and ISNA executive Fatima Salman. 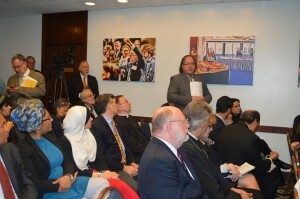 Interfaith leaders who attended the event included Rev. Ron Stief, Cardinal Theodore McCarrick, Rabbi Jonah Pesner, Rev. Dr. A. Roy Medley, Rabbi Marc Schneier, Rev. Richard Cizik, and Rev. Fr. Dimitrios J. Antokas. ISNA leaders reissued the 2005 fatwa against terrorism, reaffirmed the rights of religious minorities in Muslim-majority nations by means of the recent Marrakesh Declaration, and committed themselves to working closely with administrations to help prevent radicalization. While the press conference was well-attended by Muslim, Christian, and Jewish leaders, only two media outlets were observed: CSPAN and a US-funded Iraqi television station. The visible absence of Fox, CNN, MSNBC, al-Arabiya, al-Jazeera, Press TV, and Russia Today, suggest that mass media has little to no interest in broadcasting Muslim efforts to oppose extremism and terrorism.